Everything vibrates – EVERYTHING. Nothing in the universe is standing still, we and everything around us are in a constant state of vibration. “Om”, when chanted, vibrates at a frequency of 432 Hz – which also happens to be the same frequency as everything in nature. Thus, when we tune into that sound, we’re are connecting with and acknowledging our connection to all other living beings, to nature and to the universe as a whole. And if connecting to all other beings, nature and the universe isn’t enough to get you interested, how about the health benefits? 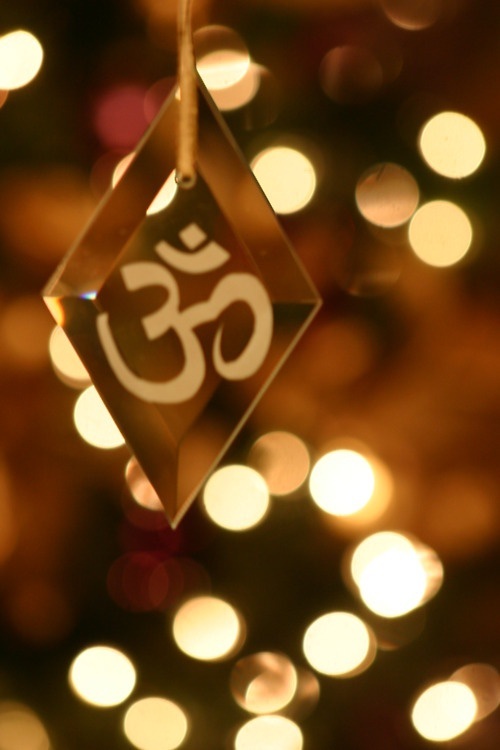 The Om vibrations slow down the nervous systems and calm the mind in much the same way a good meditation will. When the mind is calm, the blood pressure is lowered. When the blood pressure is lowered, the heart is healthy. When the heart is healthy, all is good and right with the world. But in the end, for a lot of us, chanting Om at the beginning of our practice connects us to the yoga practice in a much more mindful way. It signifies that practice has started. It is time to let the world go and practice mindfully, to be present, to engage with the instructor, the room, and ourselves in a way that goes beyond yoga poses. It is a symbol that now is the time to take care of ourselves and focus on the present moment. It brings us to the deeper meaning of why we practice yoga – the mind, body, soul connection. For one tiny sound, om is deeply complex. Apply these simple mouth adjustments just as you would shift an asana to maximize its potency. For “ahh,” relax the jaw. The sound rises from the belly, lips are parted, and the tongue doesn’t touch the palate. In “oooh,” the lips gently come together as the sound moves from the abdomen into the heart. During “mmm,” the tongue floats to the roof of the mouth, and the lips come together to create a buzzing in the head. Some say this syllable goes on twice as long as the others. Silence — or om’s “fourth syllable” — follows while the sound fades into nothing. Observe how you feel now.